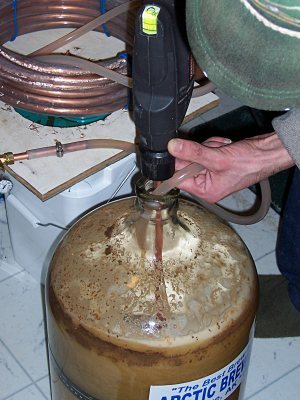 This is chucked into a drill and inserted into the carboy where it forms a vortex in the wort and after a couple minutes, enough oxygen has dissolved into solution to provide for rapid yeast reproduction necessary for a good ferment. The image on the left shows it in action, although you can't really see the deep vortex from the photo. 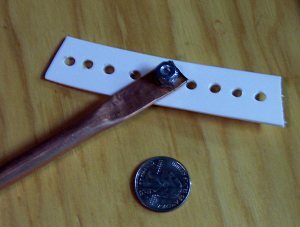 It's made from a piece of 3/8" copper tubing and a piece of plastic from a cat litter bucket. The two parts are connected with a machine screw and two nuts tightenet together so they won't come off, but allow the plastic paddle to spin freely. I use glass carboys for primary and secondary fermenation and this allows the paddle to fit through the narrow neck. 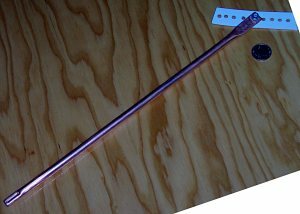 Mine is about 20 inches long, and I found that this is about as long as is appropriate with soft copper tubing before you risk it bending in use and potentially breaking your carboy.